GearBuyer has the largest selection of Synthetic Sleeping Bags from the best brands. 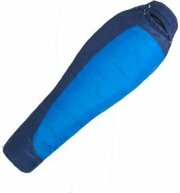 Synthetic Sleeping Bags provide better comfort in damp conditions than Down Sleeping Bags. Stay warm and comfortable with GearBuyer's selection of Synthetic Sleeping Bags. Lafuma Active 45 Degree Synthetic Sleeping Bag - Very light 45° sleeping bag providing effective and comfortable insulation. Anti-jamming constructionDouble-ended zipper with glow-in-the-dark zipper pullsInterior pocketDraft tubeAnatomic foot space. Marmot Trestles 15 Sleeping Bag (Synthetic) - Marmot's Trestles 15 Sleeping bag is built with Marmot's famous quality and design. Rich in features, the Trestles 15 is built for backpacking and river trips undertaken in cooler climates. Marmot also makes this bag in and x-wide and long version for those who like a bit more room to move around. Insulated Collar with Easy Access Cord - Engineered to Close Without Velcro, Keeps Warm Air Trapped in Your BagWave construction - offers the advantages of both traditional blanket and shingle construction with no significant weight increase. Vaude Sioux 800 Sleeping Bag - Synthetic Mummy - Vaude Sioux 800 sleeping bag features soft Bluesign fabric in a mummy design. This synthetic-insulated bag is great for cool evenings under the stars or nights in the cabin.40 denier nylon ripstop shell constructionBluesign fabric is soft on your skinContoured hoodSensofiber microfiber synthetic insulationInternal security pocketMade in ChinaStuff sack includedBy Vaude of GermanyMummy cut maximizes warmth without constriction. Kelty Cosmic 35 Sleeping Bag (Synthetic) - Solid - The lightweight Kelty Cosmic 35 is the mummy bag of choice for summer backpacking adventures. Value-minded adventurers in both wet and dry climates will appreciate how comfortable and stylish this synthetic bag is. Fits to 5' 4" / 163 cmTwo-layer, offset-quilt constructionSleeping pad security loopsGround-level side seams prevent heat from escaping3/4-length, two-way locking zipperZipper draft tube with anti-snag designStuff sack includedCaptured cordlockInternal liner loopsComes in a display boxFatMan and Ribbon drawcordsHang loops for storageDifferential cut to maximize loft and warmth. Kelty Cosmic 35 Sleeping Bag (Synthetic) - Pattern - The lightweight, women's-specific Kelty Cosmic 35º is for value-minded adventurers in both wet and dry climates. They will appreciate how comfortable and stylish this synthetic bag is. Two-layer, offset-quilt constructionWave stitchingSleeping pad security loopsGround-level side seams prevent heat from escaping3/4-length, two-way locking zipperZipper draft tube with anti-snag designInternal liner loopsWomen's-specific designFatMan and Ribbon drawcordsComes in a display boxHang loops for storageStuff sack includedCaptured cordlockDifferential cut to maximize loft and warmth. 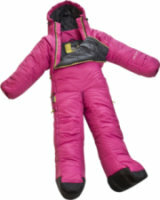 Nemo Harmony +25 Synthetic Sleeping Bag - Mummy bags are great if you sleep on your back. If you're a side sleeper, Nemo has you covered with their Harmony +25 Synthetic Sleeping Bag. With extra space in the elbows and knees, your body can shift and bend unhindered through the night while the taper at the hips maintains thermal efficiency and low weight. Other details like warm and soft Primaloft insulation, an adjustable, contoured hood, and a tuckable Blanket Fold add comfort and protection on cold nights. Kelty Cosmic 0 Sleeping Bag (Synthetic) - Solid - Built to perform on cold nights without breaking the bank, the Kelty Cosmic 0⁰ Sleeping Bag provides a high degree of warmth, comfort, and durability. Equally at home in the frontcountry as it is in the backcountry, this versatile bag provides a great night’s sleep in almost any situation. Two-layer off-set quilt constructionTop baffle collarSleeping pad security loopsinsulated hood baffleGround-level side seams prevent heat from escaping3/4-length, two-way locking zipperZipper draft tube with anti-snag designFatMan and Ribbon drawcordsStuff sack includedHang loops for storageDifferential cut to maximize loft and warmthCaptured cordlockInternal liner loops. Mountainsmith Monarch 0 Sleeping Bag (Synthetic) - The Mountainsmith Monarch 0 Degree sleeping bag with synthetic fill features a relaxed mummy fit (fits to 6'4" with shoulder girth up to 65") and accommodates a host of features guaranteeing a sound night's sleep. Add in the value of the cotton storage sack and sil-nylon compression stuff sack (stuffs down to 16 in x 10 in / 40.6 cm x 25.4 cm) and this bag can't be beat. Big Agnes Pristine 17 Sleeping Bag (Synthetic) - Beauty sleep is important, even in the backcountry (camping fact #6: bears won't eat you unless you've got bags under your eyes), so make sure you wake up well-rested every morning by spending chilly nights in the Big Agnes Pristine 17-Degree Synthetic Women's Sleeping Bag. The Pristine, which weighs in right around three pounds, uses Bluesign-approved Pinneco Core insulation to provide a top-shelf combination of light weight, warmth, and breathability that's perfect for lightweight backpacking trips when nights are expected to drop into the teens. Eureka Casper 15 Sleeping Bag (Synthetic) - Eureka Casper 15F Synthetic Sleeping Bag - Regular Size Features. Eureka Casper 15F Synthetic Sleeping Bag. Enjoy camping on the outdoors with the Eureka Casper 15F Synthetic Sleeping Bag. This sturdy sleeping bag ensures total comfort at an affordable price. It's built with impressive technology developed to give you a comfortable surface to sleep. Featuring a unique Rteq insulation, which is a blend of 4 durable polyester fibers, chosen for its weight and thermal efficiency, this bag keeps you warm. Mountain Hardwear Lamina 20 Sleeping Bag (Synthetic) - Mountain Hardwear's Lamina Series Sleeping Bags focus on providing backpackers with the packability and light weight they need with a more spacious mummy cut for the camper who likes a little extra room while they sleep. The +20 degree bag will keep you warm and safe with Thermal. Q insulation that can hold up well in wet conditions on shoulder season trips. A full length two-way zipper lets you get in and out easily and vent exactly where you need it during the night. Mountain Hardwear Ultralamina 15 Sleeping Bag (Synthetic) - The Mountain Hardwear Ultralamina 15 is a premium women's synthetic bag, ultra lightweight for gram counting backpackers 15 F/-9 C. Engineered to be the lightest and warmest synthetic bag available. Water-repellent Thermal. Q insulation and welded Lamina construction enhances loft and eliminates cold spots. Increased insulation sets temperature rating to T-Comfort for a warmer bag. Ultra-lightweight wind resistant shell. Single ¾ length #3 zipper and performance mummy cut maximizes thermal efficiency and minimize weight. Mountainsmith Poncha 35 Sleeping Bag (Synthetic) - Mountainsmith Poncha 35F Synthetic Sleeping Bag Features. 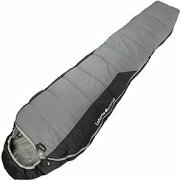 Mountainsmith Poncha 35F Synthetic Sleeping Bag. The Mountainsmith Poncha 35F Synthetic Sleeping Bag is the result of Mountainsmith's extensive experience and meticulous research. This relaxed mummy style hooded bag is very comfortable and is rated for 35 degrees Fahrenheit. The relaxed mummy can store a camper who is 6 foot 4 inches tall and has a shoulder width of 65 inches. Mountainsmith Boreas 40 Sleeping Bag (Synthetic) - The Mountainsmith Boreas 40 Degree synthetic bag features a relaxed hooded rectangular shape. Add in the value of a Poly compression stuffsack and this bag can't be beat. Fits up to 6'6"Offset quilt constructionRelaxed hooded rectangular styleStuffed dimensions - 16 x 9 inchesZips out flast for blanket style if neededRight hand zipAnti-snag zipper reinforcementTemp rating 40F / 4.5CCompression stuff sack included. Poler Napsack 50 Wearable Sleeping Bag (Synthetic) - The Poler Napsack Wearable Sleeping Bag is perfect for summer trips, couch surfing, music festivals, jumping into after snowboarding, surfing or any other activity that bring your core temp down. Its not too hot for inside and is awesome for wearing around the house in the winter. A cinch at the bottom so that you can open it up and stick your legs outHike it up to your waist, cinch it, and wear it like a puffy coat around the campfire. Musuc Selk Bag 4G Lite +45 Synthetic Sleeping Bag - You don't have to hear your kids say that don't want to get out of bed in the morning when you give them Musuc's Selk'Bag 4G Lite for kids..
Musuc Selk'Bag 4G Patagon Synthetic Sleeping Bag - It's walk & wear season with Musuc's Selk'Bag 4G Patagon Synthetic Sleeping Bag is perfect for people who feel restricted by traditional sleeping bags or for a cozy alternative to wrapping up in a blanket around camp..
Musuc Selk'bag 4G Classic Synthetic Sleeping Bag - Who says you have to get out of bed? 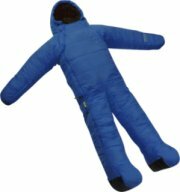 The Selk'bag 4G Classic is perfect for people who feel restricted by traditional sleeping bags or for a cozy alternative to wrapping up in a blanket around camp..
Marmot 20 F Sorcerer Sleeping Bag - Synthetic Mummy - Marmot's 20°F Sorcerer sleeping bag is so lofty, you might just wonder if it's down. Overlapping waves of cozy Spirafil insulation eliminate cold spots and keep you warm, and the quality synthetic fill dries quickly when it gets wet. Wave construction prevents cold spotsLightweight Spirafil synthetic insulation is soft, warm and compacts easiyDrawcord hoodMade in ChinaSnagless draft tubeHanging loops for dryingTrapezoidal foot box for more foot roomCannot ship to Australia. The North Face Lynx Sleeping Bag: 40 Degree Synthetic - Short of actually knitting yourself a sweater out of bobcat fur, there's no better way to stay warm on summer nights than The North Face Lynx 40-Degree Synthetic Sleeping Bag. One of the lightest, most packable synthetic summer bags on the market, the Lynx is EN-rated to keep you easily comfortable to 47 degrees, and won't have any issues if temps drop down into the 30s. Marmot 30 F Mystic Sleeping Bag - Synthetic Mummy - This superior Marmot 30°F Mystic mummy sleeping bag offers Climashield HL synthetic insulation and a classic trapezoidal footbox. Wave construction prevents cold spotsDrawcord hoodClimashield HL synthetic insulationLeft zipTwo way zippersMade in ChinaSnagless draft tubeCannot ship to AustraliaMummy styleHang loops. Mountainsmith 20 F Redcloud Sleeping Bag - Synthetic Mummy - From Mountainsmith's Performance Series, the Redcloud 20°F sleeping bag features MountainLoft hollow fiber synthetic insulation for an unbeatable warmth-to-weight ratio. 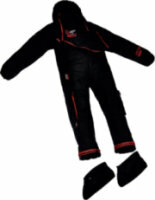 Neck baffle collar retains body warmthForm-fitting adjustable hood for comfortMountainLoft hollow fiber synthetic insulationFull-length draft tubeCalf-length, two-way locking zipperAnti-snag zipper reinforcementMade in ChinaTraditional mummy shape for maximum warmth retentionExternal hang loops for dryingIncludes compression sackContoured footbox. ALPS Mountaineering 0 F Echo Lake Sleeping Bag - Synthetic Mummy - Stay warm through cold backcountry nights in the Echo Lake sleeping bag from ALPS Mountaineering, comfort rated to 0°F thanks to cozy polyester fiber batting insulation. Polyester fiber batting insulationMade in ChinaMummy bag.